Step One: What is the painting for? This particular painting is for a themed exhibition in September. The theme is Light and Shadow therefor my imagery needs to convey that message in a clear manner. Step Two: Find an image. When this exhibition first presented itself to me I had many visions in my head of subject matter, etc…but it took me a very long time to finally commit to one and actually capture it on film. The painting size was the crux that made me realize what I should paint and how to crop it. I decided on a surface size of 18×36 inches. I wanted to paint flowers but more specifically their shadows and also include a coloured shadow. After deciding on that, I purchased some interesting cut flowers from the shop I occasionally work at and arranged them in a way that would make for interesting shadows. I used silvery green Poppy pods, blue agapanthus and umbrella fern for the larger shapes. I then gathered a few flowers from my own garden to fill in and add additional shapes and sizes. Lavender, echinacea and feathery astilbe’s. I wanted to use primarily shades of green, violet with accents of pink. Step Three: Crop and adjust image in Photoshop. As I mentioned before, my panel size pretty much determined how I would select my image and the way it was to be cropped. I decided that I wanted to paint almost life size (on second glance I believe that it is life size) and that I wanted the panel to be horizontal to maximize the shadows. As for adjusting I wanted the colours to be vibrant and I wanted the shadows to have colours within them as opposed to just leaving them neutral. As you can see, the image is stark but lush at the same time. 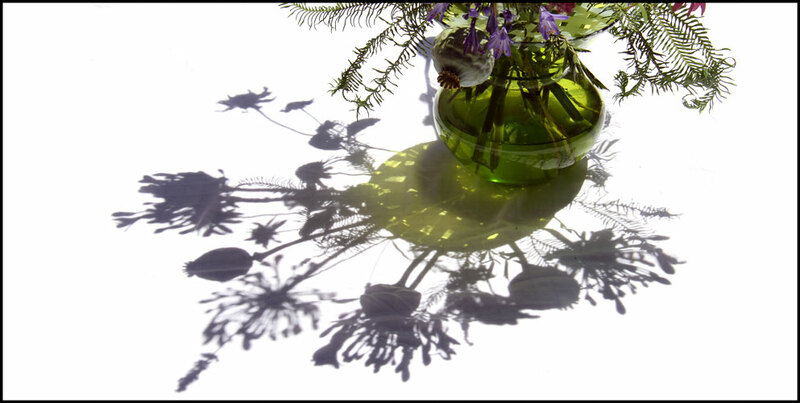 I wanted the focus to be on the shadows and colours rather than where or what the vase of flowers was on. I really love cast shadows that have colour to them, like a sunbeam going through a piece of stained glass. That appeals to me and thought it would be very appropriate for this particular theme. What do you think? Step Four: Prepare painting surface. I decided a while back that I enjoy painting on a more solid surface such as masonite or in this case, wood panel. As per usual I primed the surface and sides with multiple coats of gesso, with a light sanding in between. I ended up using the prepped surface to test a commissioned piece out, so I had to add a few more coats of gesso to cover up the test. You can vaguely see it now but no worries, I will be painting the entire surface so none will be the wiser! Step Five: Print out reference image and add a grid. I know I have mentioned in previous posts that when I am painting subject matter that is organic ie. plants, I prefer to use an Organic Transfer Method (eye ball the image onto the painting surface) but in this case since the vase and the location of the shadows are pretty important I decide to use a combination. First I printed out a good copy of the reference image which I will later refer back to as I paint. Then I printed out a second copy but in black and white of which I added simple grid lines indicating the centre both vertically and horizontally and indicating further divisions going vertically. Step Six: Transfer image to painting surface. I transferred the main parts of the image onto the wood panel. 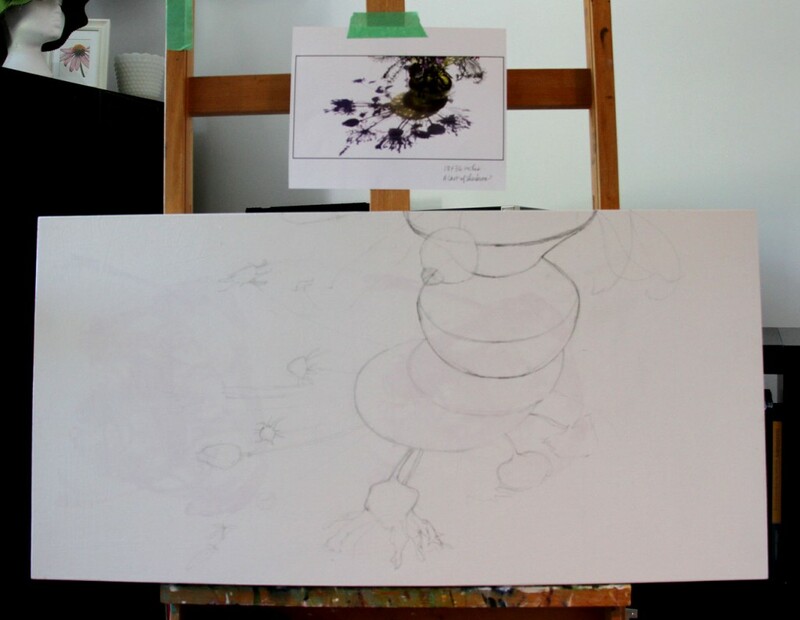 I am saving the more “complex” areas like the tendrils from both the agapanthus and ferns until I start painting. Those areas I feel need to be more organic which warrant waiting until I am fully focused on capturing their shape. Plus I have a slight aversion to spending a great deal of time on things that I know will change. I know the shapes of the flowers will change from what they are now, so I am choosing to just use the bare bones for an initial indication. I have yet to complete the next step, which is colour washing. Stay tuned for that post! 2 Responses to "A Cast of Shadows: The beginning"
I really like the composition you have chosen and how you have planned to execute it. Even at this stage it is striking – the shadow almost appears to be a reflection on a mirror. – very effective – Happy painting – will follow you on this one. Thanks Rejeanne. I really did enjoy the process of this painting. I think the vastness of the white helped make things less stressful. Less to worry about and it gave me more of an opportunity to just focus on the “coloured” areas. I’m really digging the white background and I foresee a series in the works!